Cary, NC – Grace Stocker of Chocolat Grace LLC won the International Rising Star Award in 2017 when she first participated in the Academy of Chocolate‘s (AoC) award ceremony. 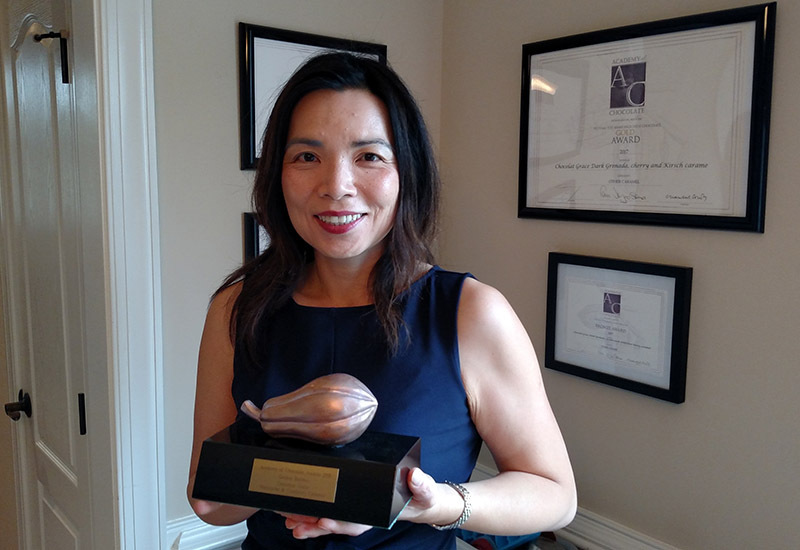 This year, she returned to competition and took home the Golden Bonbon Award, establishing her as one of the world’s top chocolate makers. Stocker won the Golden Bonbon Award for her Maracaibo and Cranberry Caramel chocolate. The Golden Bonbon is one of two top prizes at the competition, with the other Golden Bean Award only going to bars of chocolate and not the artisan, filled chocolates that Stocker makes. 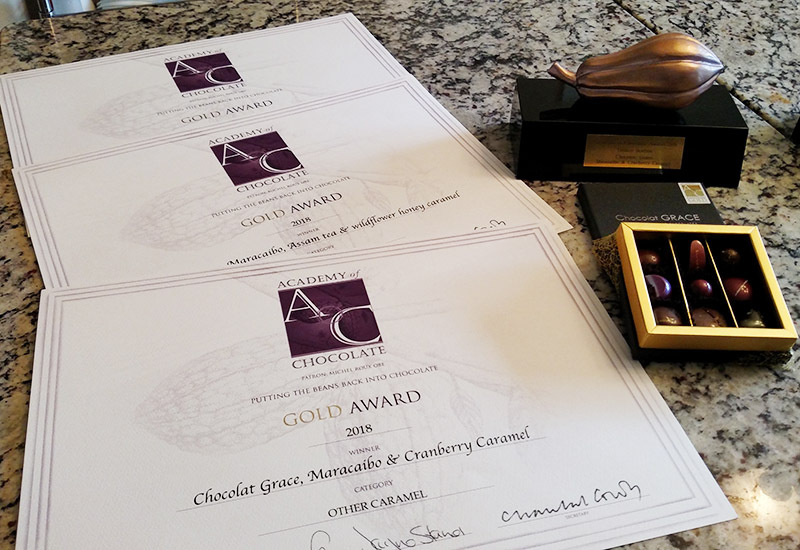 The Maracaibo and Cranberry Caramel chocolate was also given one of 11 Gold Awards for filled chocolates, with two of her other chocolates also winning a Gold Award. This year’s AoC competition had 1,200 entrees from more than 40 countries, its largest entrant pool since the competition started in 2005. Stocker said she got the idea for her cranberry and caramel chocolate from her own dislike for very sweet chocolates. Since last year’s competition, Stocker said she has been trying to refine her filled chocolates. For example, last year Stocker had a chocolate made with local wildflower honey and Assam tea that earned a Bronze Award. Since many of the judges in the competition are British, Stocker said they take the tea flavor very seriously and she worked to perfect it, and this year that same chocolate earned a Gold Award. Chocolat Grace started in late 2016 and Stocker is focused on being the only one to make her chocolates. Since last year, Stocker said she has been able to offer more flavors to customers but still wants to focus on direct sales. “I’m not looking to grow too quickly. I want to control the quality of my products and keep up with demand,” she said. Stocker also went back to train last year, studying how to make custom design pieces out of chocolate in Belgium. 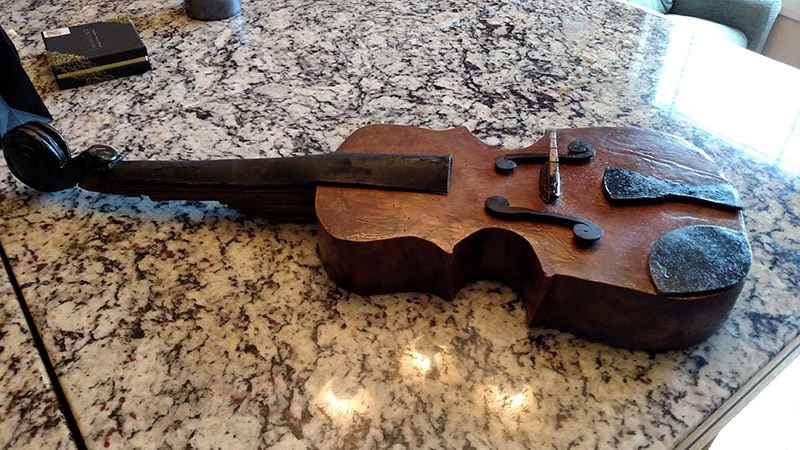 She showed off her new skill with a violin she made entirely out of chocolate. But after winning the top prize in the AoC competition, Stocker said this win has encouraged her to have even more ideas and designs for chocolates. Chocolat Grace chocolates are available to order online.